This tapestry "The Holy Grail (The Vision)" is based on the design by Edward Burne-Jones and woven by Morris & Co in 1895-96. It is one of the six panels illustrating the story of the Holy Grail. The original is in the Birmingham museum. In this scene we see a detail of the three angels who are outside the chapel where the holy grail is located. The angels are keeping Sir Bors, and Sir Perceval in their position while Sir Galahad attains the holy grail in another scene. 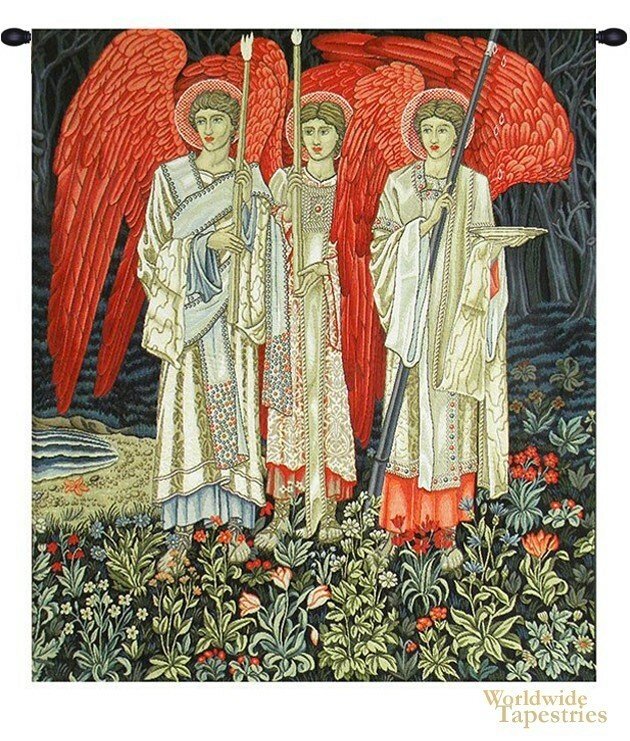 The angels appear as beacons of color in a scene where the trees in the background are dark and blue while the forest floor is lit up with flowers and foliage. This tapestry is backed with lining and a tunnel for easy hanging. Note: tapestry rod and tassels, where pictured, are purchased separately. Dimensions: W 23" x H 27"
Dimensions: W 41" x H 54"